Tarps Plus Blog: Who Would Use Mesh Tarps? Mesh tarps are tarps that are made of a mesh material that is convenient for securing objects that are able to be exposed to the elements. They are great for use in transportation, outdoor activities and a host of other things. Those that transport items in the back of a truck might want to use mesh tarps. The fact that the mesh allows for airflow could mean that the driver can get better gas mileage than they would if they were using a solid one. That's because the air has less to resist against. This can be convenient even if you aren't carrying a load! The mesh tarps also allow for ease of visibility. When something needs to be covered or secured, but also needs to be seen, these are the perfect solution. A mesh tarp allows for some protection of what's underneath while not hiding it from view. Some people even use them for outdoor recreation. Since they are mesh, they allow air to flow through. 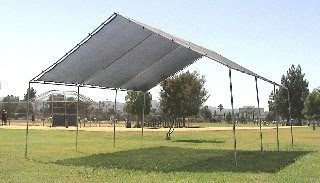 If the tarp is being used as a type of shading device, this works out well since the wind isn't able to carry it off of its post! Since mesh tarps allow for ease of visibility, it makes it easy to find what you're looking for when you need it. You don't have to remove the entire tarp just to make sure that what you are looking for is under the tarp. Instead, you can jut glance through the mesh and see what you're looking for! Mesh tarps are great to have around. They are easier to store than solid ones since there is less material to fold up. That means they are easy to transport too, not being near as heavy as a solid tarp. If you need something that's easy to use, provides some measure of security when moving items and doesn't require much maintenance, these might just be what you're looking for. The mesh tarps were great and they came quick. They cut the wind really well until Hurricane Earl came along and blew our whole canopy away. We should have taken it down. We will ordered more today.